So, so... This is a review of some products that i've been using over the past few months, and as you see it is a #1, so there will be posts like this in the future as well. Let's start with the body lotions. 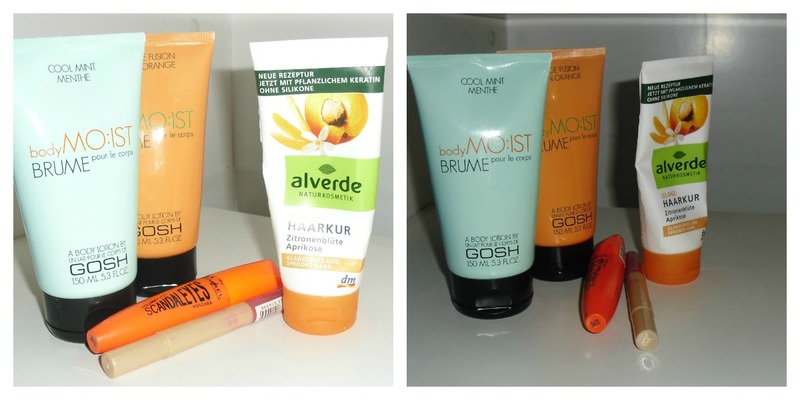 I am obsessed with body products, especially lotions and i have a lot of them, but i chose these empties because they are my favorite. GOSH lotions are very light and they are perfect if you have normal skin, not too dry, because as i said they are very light, not too greasy and over-the-top moisturizing. But, there are a lot of different scents and i tend to try them all. My favorite between these too has to be the Orange Fusion because i love fruity scents. The Cool Mint is also good, especially for summer time because it has a cooling effect, but i'm not a number one fan of the smell. Next, it is the Alverde Hair Care or Hair Mask, whatever you like to call it, i don't even know for sure if there is an actual difference. I'll start with the smell ( i don't know what is it with me and product scents, but it's the first thing i'm checking before i buy something ) - it's fresh and lemony, and i love it. And for the care part, it was good at the beginning, but as the time passed my hair became.. you can say used to it, or had enough of it and i didn't like it as much as i liked it before. Also, i won't buy it again, one time was enough for me. But, i've heard positive opinions about it from other people, so i guess it's an idividual experience, so if you wanna buy it, just do it, it's not even expensive at all. 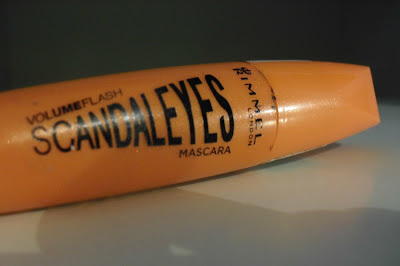 The next product that i absolutely LOVE, and it is my all time favorite mascara, it's the Rimmel London Scandal Eyes Mascara. You know that the eyes are very sensitive and we should change the mascara we're using every three or four months, and i did, but.. i have this thing for almost a year now, i don't know why i keep it, but anyway.. and it has not dried at all. I mean it's like i bought it a week ago. It gives volume and structure to the lashes, and i won't use any other mascara ever again, it's just perfect! 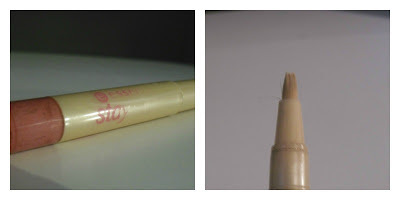 Okay, so.. i'm guessing we all have a MUST HAVE product, and for me that is the Essence Stay Natural Concealer, #04 - shade: Soft Honey. It's amazing! Sometimes i just put on the concealer and a little bit of mascara, nothing else, and it's enough for day time. It really covers dark circles around your eyes, and some red spots here and there, and it's very light, like you don't have anything on your skin. And since i don't get enough sleep because of the lame schedule i have, this thing is a salvation. Well, i guess that is it for now, stay tuned for other Empty product reviews, i hope you find some of this helpful. Лосионите за тело на Гош се да се гризнеш и да бегаш, и јас сум опседната со нив и морам сите да ги пробам, моментално ги имам Creme Brulee & Blackberries, а тој од ментол ми е баш летен и освежувачки, нареден на листа кога ќе се потстопли малку, таман за жешките денови. Јас одамна барав добар коректор, користев прво еден во стик форма од Авон ама беше премногу сув, го сменив за уште еден во стик форма од Балеа, добар е, ама не ми покрива нешто многу. Би сакала да го пробам овој од Есенс, штом толку го изнафали :D Колку е? Имам доста мрсна кожа, и плус коректоров кога ќе го ставев, абе светев на 200 метри далечина, како рефлекторче. :D И ради тоа дури почнаа и подкожни акни да ми излегуваат на некои места, едвај гo оправив лицево :(. Se slozhuvam za losionite za telo-mmm super se!! Е вака, супер review :) Немам користено ниеден од овие производи, но можам да ги препорачам моите - лосиони и млека за тела - на врвот ми се оние од марката на Балеа, почнувајќи од мед и млеко па сите останати овошни. Голем дел од коментаров ти зафатив, можеби треба и јас да направам сопствен пост, а? Nice products!!! would you like to follow each other with GFC and Bloglovin?